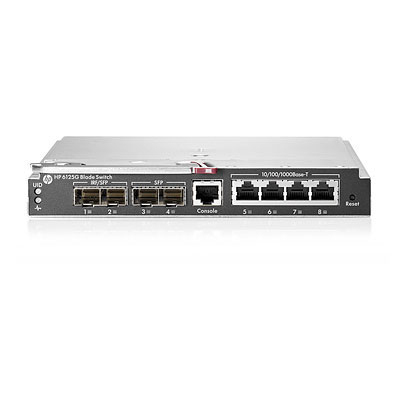 Designed for the c-Class BladeSystem, the HP 6125G Blade Switch provides sixteen 1Gb downlinks and eight 1Gb uplinks. It is perfect for customers who are on a budget or who require basic 1Gb switching and want to datacenter efficiency and capability. The HP 6125G combines the resiliency of Intelligent Resilient Networking (IRF) with the Comware operating system. Switches can be combined at the enclosures, rack or datacenter level into a single virtual switch, managed through a single IP address. Comware OS provides a common level of features, service and security from edge to core. All network elements can be managed through Intelligent Management Center (IMC), providing comprehensive single pane provisioning of the entire network. The HP 6125G supports IPv4, IPv6, full layer 3 routing, and distributed trunking.